Alvaro Noboa was born to Luis Noboa and Isabel Ponton in Guayaquil, Ecuador, on November 21, 1950. His life is a clear example of leadership, of the capacity to oppose to what is improperly established, of the will to stand by his principles, of the discipline required to change habits, of the perseverance to fulfill the cherished dreams of his heart, of the capacity to create and maintain large companies and the gift to govern. These qualities have made Alvaro excel as the entrepreneurial, social and political leader of Ecuador. Alvaro was first educated at San Jose La Salle, a Catholic School in Guayaquil, where he scored top grades. At the age of 13, he travelled to Switzerland to study at Le Rosey Institute, one of the most prestigious boarding schools in the world. Alvaro, surrounded by classmates made up of both European royalty and future magnates, excelled by obtaining the Coupe Lutteur, awarded only to the school’s most academically distinguished students. After his graduation, Alvaro returned to Ecuador and validated his social/philosophical studies, excelling once again by obtaining the single highest grade in his class. Among every university in the country, he chose the State University of Guayaquil to study a legal career and thus continue his academic training. This astonished his classmates and teachers, as Alvaro had chosen an institution intended for students from lower-income families. His choice enabled him to meet, understand and become friends with lower- and middle-income students, with whom he has maintained contact throughout his life. His fine academic performance earned him a degree allowing him to practice law in Ecuador. Alvaro, however, decided to pursue his professional career in the business field as a successful entrepreneur. Indeed in 1973, at the age of 23, he began in the real estate business by establishing Promandato Global S.A., a firm that unites a construction company, an urban development company and several real estate companies, with assets hovering around £90 million. In 1998 it was considered to be one of the largest firms in Ecuador. In 1986, he established ‘La Verdad’, a monthly magazine. In 1990, he founded Banco del Litoral, one of Ecuador’s most reliable banks. Two years later, he established the Global Financing Company and other investment companies on an international scale. All these companies and businesses together became known as Grupo de Empresas Ab. Alvaro Noboa P.
The experience that Alvaro Noboa gained from managing his own companies, in addition to the courses he took in business administration at the American Management Association, helped him to assume the leadership of two more groups of companies: the Noboa Group in 1994 and the Noboa Corporation in 1997. Today, he controls more than one hundred companies, which include industrial, agro-industrial, shipping, automotive, real estate and financial concerns. In 1977, the special social sensitivity that his mother Isabel Ponton and his grandmother Zoila de Noboa always instilled in Alvaro, took shape in the establishment of Fundación Cruzada Nueva Humanidad (Crusade for a New Humanity Foundation), which began with the philosophy of fighting misery, disease, ignorance, spiritual weakness, hatred and other misfortunes that afflict man. The Foundation is based on the Christian beliefs of love, unity and self-improvement; beliefs manifested in deeds. Twenty-seven years later, the foundation continues its mission. 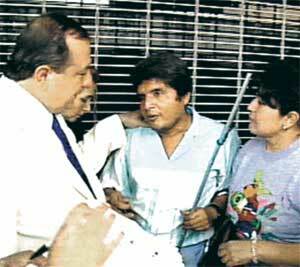 Commercial success has paved the way to politics, and in 2002 Noboa founded the Prian Political Party. Alvaro’s life passed without major incident until the entrepreneur decided to pursue public life. In August 1996 he was appointed president of the Ecuadorian Monetary Board. While chairing this institution, Alvaro managed to raise the international monetary reserves of Ecuador from $787 million to $1.1 billion in six months, and to lower interest rates by 12 percentage points. Since then, the monetary reserves of Ecuador, although the country adopted the US dollar as its currency, have not reached the peak that Alvaro Noboa achieved. 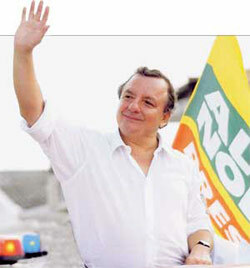 In 1998, Alvaro Noboa became the outside runner in the presidential elections. He achieved a technical draw with the man who then became President of Ecuador. Alvaro’s popularity was left unscathed, and on September 20, 2002 all polling companies with the exception of one predicted that Alvaro Noboa would have become President of Ecuador if the elections had been held on that day. Today, polls show that Alvaro Noboa remains as number one choice of the Ecuadorian citizens to become the next President of Ecuador. In 2002, Alvaro inspired and guided the foundation of the Prian Political Party. The Party was an immediate success and gained ten seats in congress in less than six months after its establishment. 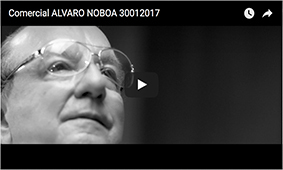 During the last presidential campaign, Alvaro’s mission was consistent with his career path and life. The mission stated the need to fight corruption, reactivate the economy, provide jobs for all Ecuadorians, promote low-income housing for all citizens, establish a national health plan and implement an education plan. Today, Alvaro Noboa is seen as a political, economic and social leader in Ecuador.